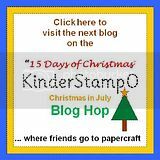 Shelley Bean: Kinderstampo Christmas in July Blog Hop!! There were gingerbread boys! Lots and lots of gingerbread boys! I purchased this wooden frame at Michaels for a mere $1.50. I covered it with paper, framed the picture opening with a button garland on wire and made a woven ribbon background..... and my fun garland of gingerbread boys. Fourteen to be exact! The gingerbread boys were colored with Copic Markers (of course) and the stamp was a retired D.O.T.s rubber stamp. You could use any stamped image or embellishment of your choosing to get the same effect. The following is a short video on coloring my little gingerbread boy. I hope you enjoy!! Please stop by and check out my original and one of a kind rubber stamp designs. If you make a purchase this weekend, during our blog hop I will also throw in a surprise! Just leave a comment there or shoot me an email when you order. Love the gigerbread man. I love copic markers. thanks for sharing. Very cute... gotta get some of those Copics!! I haven't used the copics yet, thanks for the video. Love the frame!! I am already a follower so I was happy to see you in the blog hop! Such a great idea and love what you did with the copics : ) Thanks for the awesome project and for joining us on the blog hop. I am following! Thanks for sharing! Hi Shelly ! TFS the projects and especially the video ! Great job ! 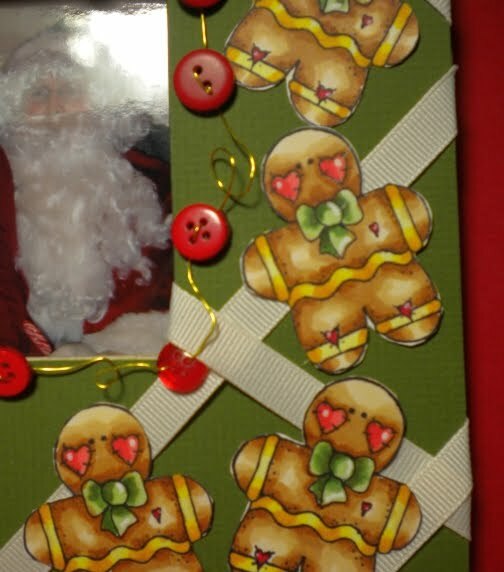 Looks like a memory board project - great gingerbread men - such fun for a photo frame! what a cute what to dress up an inexpensive frame!! Adorable gingerbread men. Thanks for sharing your great ideas and talent! Love your project its so cute! Thanks so much for sharing!!! Great project! TFS. Cute stamps. This frame is so adorable! Thanks for sharing. I love your gingerbread men! They are adorable! Thanks for the great giveaway! What a cute project, I am playing with my copic markers and going to take a class at CHA. Thank you!!! Hi !!! Absolutely adorable !!! Love what you did with the frame nad the gingerbread men !!! TFS Martha C.
So very cute. I have not had a chance to use copic markers yet, but would love to try them. Super cute video. How cool!! I got to this site and I was like wait a minute... I recognize this site and your colorings!!! you're the reason I'm checking out my local Hobby Lobby cuz they have Copic markers on sale this week.. which ends today! I loved your tutorial on coloring with them. Great job on this frame!! Love your work. The frame is soooo cute! really cute, you're getting so good with the copics! great idea for the frame! Adorable frame. Thanks for sharing. Yum Gingerbread men! look like cookies makes me want to eat them! btw-the song in your video had me laughing! very cute. Very creative project. To decorate a frame is a great idea. Thanks...cute stamp too. I bought some of these frames from Michaels and they are just sitting in the garage...now I know what to do with them! Love the gingerbread men, they look good enough to eat! Cute frame. Never tried one but I will now. Thanks for the idea! Love your project , very cute TFS. Your gingerbread men are sooooo cute - I am just getting into copics and it is so addictive! Great frame. I am allready a follower. those gingerbread men are too cute ! Your stamps are very cute. Love the frame. soooo super cute! wish there was a michael's store here in hawaii. i just became a follower on your page. Oooohhhhh! I love the gingerboys! Your Gingerbread boys are soooo cute!! I would love to learn how to use copics, can you suggest a good way to learn how to use them? Loved your video. A great help in seeing how to use copics. Yes, time to think of christmas and all the cards. These ginger bread men are so darling!! Love um! Thanks so much for sharing!! Shelly, your coloring always amazes me. This is really cute. I just love Gingerbread Men. TFS another amazing project!!! the gingerbread men are cute.. I REALLY need to get copics!! I love gingerbread characters so much that when I loved in Florida my entire kitchen and diningroom had a gingerbread theme year round!! Great layout! I love gingerbread men. You do a great job with the coloring. Excellent! I just got several copic markers. Thank you for sharing. Super cute and loved the music. Makes me really want to give the copic markers a try. What cute gingerbread men! Enjoyed your blog very much , I will definately be a follower. Thanks! This def took you a while with all those gingerbread men. Very cute! I cant wait till xmas! That is sooo cute. Love the gingerbread men. TFS. Love the gingerbread men! Thank you for sharing! I love your idea of the ribon and wire and buttons! Thanks for sharing your teqnique for the copics, just bought a few in the same brown tone, so now I know how to use them. what another super cute idea! you ladies did such a great job! I can't get over it!!! Great idea! It's very cute! What a great gift idea and inexpensive too. I will have to try this. Cute ideas!! Thanks for all of the ideas on here!! I love these frames! They are so much fun to alter. Those gingerbread boys are adorable. Thank you for sharing! That is cute. What a find at Michael's on the picture frame. Thanks for sharing. What a clever idea! I love that gingerbread man stamp. Very cute project. very cool idea nice job! So cute and a lot of time involved to create this awesome page. What a great project! This would be great in your own house or for a present :) TFS. Thanks for sharing...I really want to learn how to color with copics. I appreciate your video. I'd love to learn how to color like you do. so pretty. TFS and for the candy too. Eeeee heee heee!! I got such a kick out of your little ginger guys! I'm such a huge fan of Copics so I just adore them!! Great and very inexpensive gift! Enjoyed being in this blog hop. Hope you had fun too! thanks for sharing! This is an amazing blog hop! Awesome job altering the frame! Such cute gingerbread people. Thanks for the chance to win! so cute! Love the gingerbread men! I have just found you here on the net and have become a follower. Actually saw you on Capadia Designs and stopped in to visit and loved what I saw. I'll be back often. Thanks! Great layout and I love the button garland! Thank You for sharing. I'll be back soon for more inspiration. I love the buttons and garland! Cute frame altogether! TFS! I love your gingerbread boys! wow, great coloring job... I am in awe... i can't color like that.. Your gingerbreat men are soooooo cute! Thanks for sharing your cute project! I tried to follow your blog but it appears to be down :( I'll be back...honest. ahhh... the PERFECT Grandparent Gift! This is sooooo cute! I love this!! I love altered frames and have done a few myself, but I'm gonna have to do one like this for Christmas! Very cute! Great job on the coloring. So Cute...I'm always looking for cute Christmas frames for our family pic every year, and this is great! Thanks for sharing! Love your gingerbread men! How Cute!! I love gingerbread men! Great idea! great video.. thanks for sharing. so very cute!!! I am now a follower. those gingerbread men are just to cute! I have seen the frames and often thought of getting one. Now you have inspired me. Love the idea and would be great to make a special frame for each of my grandkids. Thank you! very cute idea. I love these little gingerbread men. Okay, I LOVE LOVE LOVE GINGERBREAD people & your frame is the CUTEST EVER!!!! You did an AWESOME job my friend! 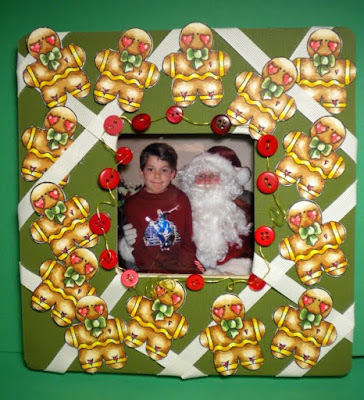 Love the frame idea, you did a great job with the gingerbread man, he is so sweet. Oh my this just took my breath away - beautifully done! I love the sweetness of the holidays but gingerbread - wow, that is just the icing on the .... cookie! :) I'm a follower ~ blessings! Love this frame - in fact, I've got 2 of them stored in my studio right now!! Better get on it! TFS and thanks for the chance to win! So very cute! Thanks for the video and the giveaway!